Along the shore a beautiful gaff-rigged sloop majestically cuts through the water taking each wave masterfully and with poise. On a nearby wharf a man turns to a friend to inquire about the impressive sloop sailing by. "Why, it's a Friendship" is the reply. Wherever a Friendship Sloop can be seen, sailing or moored, there will be people to admire her graceful lines and sailing ability. 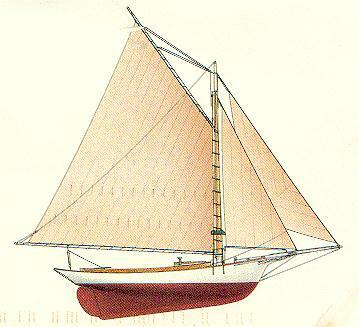 The Friendship Sloop has no real birth, but was gradually developed around 1880 from the fishing and lobstering needs of the men of Muscongus Bay on the Maine coast. It is certain some of these fishermen had seen a Gloucester fishing boat, and being impressed with lines, had incorporated some of its features into their own hull designs. These men did not build a "class boat" where every hull is the same length. From existing records we find that the original builders constructed sloops varying in length o f 21' - 50'. Probably the average length would be about 30' - 40'. The basic designed was scaled up or down depending on length, and followed a pre-set formula. They all had an elliptical stern, and most of them a clipper bow, and were gaffed rigged. The pre-set formula included such measurements as: the beam equaled one third the overall length, and the length of the mast should equal the length overall plus half the draft, etc. Boat shops dotted the coastline of Bremen, Bremen Long Island, Morse Island, Cushing, Thomaston, and Friendship. In 1903 there were 22 sloops being built on the shores of Bremen Long Island alone. Many of the men went into the woods to cut their own wood, and hauled it to the saw mill with horses. The island builders floated their sawed planks (25' - 36') suspended over two dories to get it to their offshore boat houses. Each builder had some little secret innovation which in his estimation made his model better than the others. The wives were put to work when it came time to make the sails. Usually the builder took the sail cloth out in the field to cut the pieces the way he wanted them. Then his wife had to take a "bite" down through each piece, and set it together. All this was done with a treadle sewing machine. Launching was done in many ways. Some sloops were dragged onto the ice in the spring and left to float as the ice melted. Others were hauled to the water by oxen. The usual procedure was for the fisherman to spend his winter building the sloop, fish with it all summer, sell her in the fall and start the process over again come winter. She was sold for what the builder had in it, usually $350 - $500. This schedule enabled him to have a boat to work from and something to keep him busy all winter. There are many names that are remembered as builders: Carters, McLains, Collomores, Winchenbachs, Morses and others but Wilbur Morse's name comes up as father of the Friendship Sloop because of the large number that come from his shop. It is said a sloop was launched every two or three months. Because of Wilbur's mass production and his shop being in Friendship, this great sloop acquired the name of the town he was building in. Thus it was before the turn of the century one could see Friendship Sloops all over the bay engaged in seining for herring, hand lining for cod, sword fishing, mackereling, and lobstering. Lobstering today is a difficult enough job with all the modern-day motors, electronic gear and the like, but to haul and bait traps, plus managing a huge sail and keeping a boat with about a five foot draft off the rocks must have been a full-sized order for most men. When an eighty-year old lobsterman was asked about this, he said, "Lead out the sheet of the mains'l quite a way, and trim the jib tight while you're hauling. The sloop will lay good then." The advent of motors and modern equipment around 1915 almost relegated this great craft to extinction, but her fine lines, her seaworthiness, and her great record have added "yachting" to her long list of uses. Many a yachtsman has been awed by the graceful lines of this sloop. Bernard MacKenzie of Scituate was one such sailor. He sailed his beautiful Voyager in a Boston Power Squadron race in 1960, and in the strong winds, won the race. This inspired him to have a Homecoming Race in Friendship. In 1961 fourteen Sloops sailed in a regatta, and the Friendship Sloop Society was born. Each year now a regatta sponsored by the Society is held in July in Maine and Connecticut. It is also held in Massachusetts during August. The Friendship Sloop's fishing career has given way to progress, but her charm will live forever.